It is hard to say whether the ability to see into the future might be a gift or a curse. I, for one, am not so sure I would want to know with any certainty what I will be facing – or when. Yet, it is essential that, individually and collectively, we try to envision the possibilities and determine what our course of action will be. Recently, I pulled out a copy of the Comprehensive Plan and read it through. I was impressed. It is a substantial document, weighing in at some one hundred pages. The plan is thoughtful, detailed, and forward looking. It incorporates historical context as well as a careful catalogue of contemporary issues. Some of the concerns we face today have presented themselves, albeit in slightly different form, in the past. The plan is the result of a concerted effort to determine how the citizens of Franklin envisioned the future of their community. An initial public meeting was held on March 9, 2006 at the Franklin Central School. Additional meetings were held throughout the summer of 2006. The responses to a survey mailed to all property owners in the Town and Village of Franklin were also used to get a sense of the community. 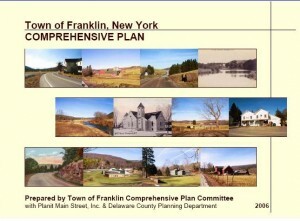 In the survey, the main concern of the citizens of Franklin was to preserve the rural character of the Town. Other important issues included protection of natural resources and preserving farming as an industry. In keeping with the desires of the townspeople to maintain their rural lifestyle while increasing job creation, the plan recommended that the Town actively support the developing arts and entertainment industries as well as other small businesses that were compatible with the Town’s rural character, including artist studios, antique shops, bakeries and cafes, as well as agri-and eco-tourism. Cultural resources, including the Franklin Stage Company and the Bright Hill Center in Treadwell, along with many local artists, provide an additional pathway to develop tourism, building on the demonstrated success of the Stagecoach Run. The plan also suggested that the Town of Franklin create public access points along the Ouleout Creek, a DEC designated trout stream that is stocked annually. Trout fishing is a major attraction elsewhere in the Catskills, where it provides substantial support for local stores, restaurants and inns. Almost 90% of Franklin residents agreed that it is important to protect farmland and keep land in agricultural production. However, it was also agreed that the Town should work more pro-actively with farmers to find ways to make it financially and ecologically sustainable to continue to farm. Along these lines, the plan proposed that the Town work with the Franklin Chamber of Commerce to establish a Farmer’s Market, which can serve as an attraction to increase tourism as well as provide an outlet for local agricultural and artisanal products. While a market has been established, it is a project of the citizens’ group Franklin Local. The Town of Franklin does not currently provide any support for the effort. In the realm of sustainable energy, the plan recommends that the Town establish standards for the development of wind farms, including noise levels, nuisance abatement, and appearance. The plan also suggests that developers of wind energy facilities pay for engineering assessments of local roads as well as cover the cost of bringing those roads up to the standards necessary to support heavy construction vehicles. Similarly, the plan recommended that the town carefully monitor proposals for natural gas exploration to assure that they do not adversely affect the surrounding properties. Today, we have been presented with a unique opportunity to reconnect Franklin to its natural and historic resources. Heritage, eco-and agri-tourism can boost the local economy without destroying our most valuable asset – the natural beauty of our land. Creating value-added goods, such as cheese, maple products, honey, pastured meats, and other artisanal products will strengthen both the agricultural and tourism sectors and allow for sustainable development. Our Comprehensive Plan is a good plan, a healthy plan, a future-looking plan. But for it to be effective, the Town of Franklin must be willing to implement its recommendations and use it as a framework to guide our decisions going forward.